Varn is proud to support local and national charities, good causes and Olympians in a variety of ways including digital marketing consultancy, search engine marketing, web design and building, print design, web technology development and financially. To find out more please scroll down. We were delighted to show their support for local backstroke swimmer, Chris Walker-Hebborn by creating his website to increase his media presence in the run-up to the 2016 Olympic games. Chris is now a world record holder and Olympic and World Champion. Bradford on Avon Cycling Festival is a two-day festival including a hill climb, sportive, family cycle ride and various cycling events in Victory Field. We had a great time support this event with staff support, website help and sponsorship. 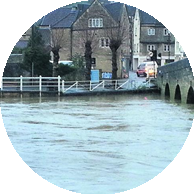 We worked with The Bridge Tea Rooms in Bradford on Avon to bring a live webcam feed from the bridge in the centre of town so that people could remotely check the river levels. The winter months in 2013 and early 2014 brought with them heavy rainfall and storms, resulting in floods in and around Wiltshire. So we kept everyone locally up to date on the river levels and flood warnings in the town/region. We were very pleased to work with Bradford on Avon Town Council and help design an A4 Flyer for them to help promote the town as a tourist destination. We are based in the town and know how amazing it is with its combination of history, restaurants, scenery, waterways and parks so we didn’t need much convincing. The Hub empower people in the community not only to relieve poverty but to encourage improvement of health and wellbeing and a sense of purpose together with volunteering opportunities. The provision the provide includes a foodbank, work club and debt and money management advice together with other services and facilities including a meeting space. We are very happy to be able to help support their website and print design needs. As a company that likes to support not for profit causes we put together a flyer and worked with Fitzmaurice School in Bradford on Avon, our local Primary School, to help with them with their fundraising efforts to pay for solar panels for their school. After them successfully raising the money they needed from local donors, including quite a few businesses, we were asked by the organisation 10:10, who worked with the school as well and helps other schools fundraise for solar panels, to make the editable print files available for every school to use.